The 20th ASEF Summer University (ASEFSU20) explored the role of transportation and trade in connecting Asia and Europe – in the past, present and future. 47 participants from 45 Asian and Europen countries traveled together for 3 weeks across China, Mongolia and the Russian Federation under the theme “Gateways of Asia and Europe: Connectivity by Land, Sea & Air". In conjunction with the 20th Anniversary of the Asia-Europe Meeting (ASEM) process, ASEFSU20 explored the concept of "Connectivity" between Asia and Europe from 3 lenses: Human Connectivity, Trade and Economic Cooperation, and Transport. ASEFSU20 leveraged on the accelerating social and economic linkages between the 2 dynamic continents. The journey passed through emerging economic corridors in these 3 countries where the participants had the opportunity to meet and learn from local communities and took upon real-scenario challenges on road, rail, maritime and air transportation. ASEFSU20 brought the young professionals and students together with government officials, businesses, academia and the civil society, and offered a top-tier environment for professional and personal development. The highly anticipated video of the 20th ASEF Summer University (ASEFSU20) is out! Now you can experience ASEF’s most dynamic and ambitious education project to-date! During ASEFSU20, 47 young professionals from 45 countries travelled across China, the Russian Federation and Mongolia by train to learn from communities, governments, businesses, academia and civil society, while solving real connectivity and transportation challenges. Watch the video highlights here. ASEFSU20 “Gateways of Asia and Europe: Connectivity by Land, Sea & Air”, which took place between 15 August - 3 September 2016 covering 6 cities in 3 countries is the latest edition of one of ASEF’s flagship projects under its Young Leaders’ Programme. Following the success of ASEFSU20, preparations are already underway for ASEFSU21 in 2017. Stay abreast of the upcoming series of youth projects and Open Calls for Application by following ASEFEdu on Facebook! 2.1 Rail A: How can security for train and underground transportation systems be increased while keeping the principles of affordability, accessibility and rapid change at bay? 2.2 Rail B: What does a fair and responsible logistics-based model that creates value for all stakeholders look like? 3.1 Sea A: How can we combat the environmental degradation at Lake Baikal arising from an increase in human connectivity due to tourism? 5 Team X: How can the ASEM Transportation Ministers’ Meeting (ASEM TMM) as well as its outcomes be better publicised amongst its stakeholders and the general public? Harbin Institute of Technology (HIT) is an acknowledged academic institution, especially in the field of engineering. Please share with us why internationalisation is so important for HIT and where the 20th ASEF Summer University (ASEFSU20) plays a role in this? Internationalisation is one of the most important strategies for universities in China to cooperate with the world-wide development in education. For HIT in particular, as a C9 Union university* with a great reputation in the field of Science and Engineering, the ASEFSU 20 is a gate for us to increase further cooperation with universities in European countries. How does HIT envision its role in connecting Asia and Europe and what are the current and prospective strategies in linking educators and students from the 2 regions? We promote strong linkages for students and educators from our university with universities in other Asian and European countries. We have numerous agreements and memoranda of understanding (MOUs) with universities to allow students and educators to experience different education methods through exchange programmes for example. * The C9 League is an alliance of nine elite universities in China, analogous to the Ivy League Universities in the United States, the U15 in Canada, the Russell Group in the UK, and the Go8 in Australia. The members of the C9 League are Fudan University, Harbin Institute of Technology, Nanjing University, Peking University, Shanghai Jiao Tong University, Tsinghua University, University of Science and Technology of China, Xi'an Jiaotong University, and Zhejiang University. What does VSUES believe that the ASEFSU20 Participants can learn from the city? The unique geographical location of Vladivostok makes it the «gateway of Russia to the Asia-Pacific Region», and one of the international centers of communication between Asia and Europe both literally and figuratively. Vladivostok is the place where the Trans-Siberian Railroad begins and goes through all Russia, connecting Vladivostok with the European part of Russia. Vladivostok is the largest transportation hub of the Russian Far East and the first free seaport of the Far Eastern basin. Annually, Vladivostok acts as a platform for communication of government officials, academics, businessmen and artists amongst others from Asia-Pacific and European countries through events as the Eastern Economic Forum, Pacific International Tourism EXPO, Pacific Meridian Film Festival, International Jazz Festival, Pacific Style Week and Music festival V-Rox. Vladivostok is diverse in terms of population, culture and cuisine. In addition, the sea offers fabulous views of the city, as if soaring out of the water, hundreds of colorful houses clinging to the slopes of the hills. During their visit to Vladivostok, the young leaders will get the chance to visit one of Vladivostok ports as well as a leading Russian automotive company SOLLERS, meet key local policymakers and academics to discuss the issues of transportation logistics in the region and see the most interesting historical places. How does ASEFSU20 add value to Vladivostok State University for Economics and Service (VSUES)? VSUES is an entrepreneurial university and an educational leader in the field of services and economics in the Russian Far East. Being located close to the most dynamic region in the world, we cannot stand aside from international cooperation with countries in the Asia-Pacific. Every year VSUES sets new objectives in accordance with current requirements and the economic needs of the Asia-Pacific Region. VSUES cooperates with more than 60 partner universities, organisations and companies overseas. The international exchange of faculty, students and information to promote international competitiveness of the university is one of the projects that the university concentrates on to be internationally recognised. We are very excited to be a part of ASEFSU20 and host the participants in Vladivostok. ASEF is a highly respected international organisation with solid experience in the implementation of international projects all over the world. In this regard, working together on the project is a great opportunity for us to collaborate with a team of professionals and to strengthen the bridge between Asia and Europe. All the ASEF participants represent young leaders of their countries and serve as role models for our students. We believe that our youth dialogue and interactions within the project will contribute to a greater understanding among Europe, Russia and Asia. What can a city such as Irkutsk, in the heart of Siberia, showcase in Asia-Europe connectivity? Throughout its history Siberia has played the role of the link between Asian and European territories and communities, with many Siberian cities functioning as multicultural centres welcoming people of different background, origin and welfare. For many centuries Irkutsk and some other Siberian cities have been open to newcomers that happened to come to Siberia due to a number of reasons. Nowadays its experience in non-conflictual coexistence seems to be a crucial element in shaping social integrity. In this sense Siberian cities and communities are a very interesting social and cultural phenomenon to explore. The social history of Siberia and Irkutsk can be considered as a glaring example of a multicultural society formation. Irkutsk, located at the crossroads of large civilisations, has absorbed traits inherent both to European and Asian communities. These traits can be traced in the city’s architecture and the day-to-day life of its dwellers. In the framework of globalisation and increasing interdependence of people and nations, the experience in coexistence of various ethnic and cultural groups is of great importance. Therefore, Siberia as a whole and Irkutsk in particular can be regarded as a convenient place for the realisation of large-scaled international projects aimed at developing a new dialogue of cultures. What does Irkutsk State University hope to gain from engaging in ASEFSU20? Irkutsk State University is committed to supporting the so-called “multi-vector” approach while implementing its international projects. Being the regional centre for innovative development and progressive thinking is not possible without the participation in ambitious international projects as the ASEF Summer University aimed at promoting connectivity in education. We do hope that being a part of this prominent project and international team results in further internationalisation of ISU’s activities and the strengthening of ISU’s position as one of the leading regional universities in the Russian Federation. The ASEF Summer University will surely give ISU a new impulse for extending its partnership links and for developing new international contacts in the fields of education and science. It can also contribute to further internationalisation of ISU’s activities. Being a leader means playing an active part in large-scale projects that can overcome national and language barriers. ISU students and volunteers will gather great experience by joining the group of young professionals that is able to find new solutions to the most pressing problems. Why is Transbaikal State University engaged in ASEFSU20? Transbaikal State University is a multi-educational, scientific and innovative complex, providing a multi-level training of highly qualified specialists for industry, governmental/municipal authorities and law structures in the area of Transbaikal region, Far East and Eastern Siberia. The university has more than 60 international agreements and contracts. Among international partners of are universities and organizations in China, Vietnam, Korea, Singapore, Mongolia, Germany, Czech Republic, Kyrgyzstan, Belarus, Ukraine, Kazakhstan and Moldova. In 2015, more than 120 of our students went abroad for trainings, internships as well as to participate in various competitions. The vast majority of these activities were possible thanks to new bilateral agreements. Today about 15 lecturers from the university are working abroad, and we have currently 5 foreign teachers working here in Chita. Also, as of June 2016, the university has 2014 foreign students enrolled. Moreover, the university holds a leading position among all the high education institutes in the Siberian Federal District. The Transbaikal State University holds an interesting geopolitical position that allows an intersection of contacts between the Russian Federation, China and Mongolia to be possible. In short: the university is one of the largest scientific and educational complex in the Russian-Chinese-Mongolian transboundary. What do you hope to gain from the project? This summer the Transbaikal State University is glad to welcome international youth guests from over 48 countries. It is not only a great honour to host the participants of ASEFSU20, but we also see the exceptional opportunity to establish new contacts and expand the geographic reach of our scientific and educational ties. The project is a great opportunity both to get acquainted with the work of various international organizations as well for our university to showcase our work, students and academics to an international crowd. We are committed to welcome the ASEFSU20 delegates to Chita and work diligently to arrange a comfortable and fruitful stay. What will the ASEFSU20 participants learn from the visit in Chita? 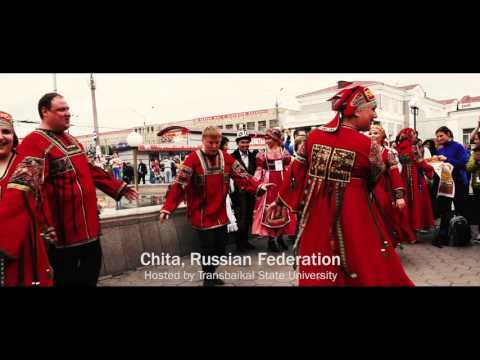 Many, including native Russians, are not aware of where Chita is situated, or has the perception that Chita is a small provincial town with little attractions. ASEFSU20 will showcase that our town has much to offer! During the Summer University, the participants will have the opportunity to learn and experience the multicultural Transbaikal region and get acquainted with the huge and rich cultural heritage of Chita – the capital of the Transbaikal region. The location of our city has throughout a long history crossed paths with the trade and exchanges between Russia, China and Mongolia. This history and contemporary reality is very much reflected in today’s local population. We look forward to meet all the individuals involved in ASEFSU20 and welcome them warmly to our hometown. Join us for a 2-week experience-intensive journey! The 20th ASEF Summer University (ASEFSU20) on “Gateways to Asia and Europe: Connectivity by Land, Sea and Air” is for those who are hungry to explore the role of transportation and trade in connecting Asia and Europe – in the past, present and future. Be a part of the Asia-Europe team of young professionals and students, who will travel together for 2 weeks across China, the Russian Federation and Mongolia. ASEFSU20 leverages on the accelerating social and economic linkages between the 2 dynamic continents. The journey passes through emerging economic corridors in these 3 countries where you will meet and learn from local communities and take upon real-scenario challenges on road, rail, maritime, and air transportation. ASEFSU20 bridges the participants with government officials, civil society and cooperates and offers a top-tier environment for professional and personal development. Experience first-hand Asia-Europe connectivity on the go! ASEFSU20 is your opportunity to apply your skills and add on an once-in-a-lifetime educational expedition! Costs? No registration or participation fee for the selected participants! Transportation, accommodation and meals? Provided during the duration of the trip. Travel subsidy? From country of residence to the starting point and back will be available. More questions? Check out the FAQs here. The application period for this project is closed.